What is angioplasty used for? What is a stent in the heart? Help keep coronary arteries open and reduce the chance of a heart attack. A stent is inserted into the clogged artery with a balloon catheter. The balloon is inflated and the stent expands and locks in place. This holds the artery open and allows blood to flow more freely. What is the difference between a stent and angioplasty? The balloon helps to widen your blood vessel and improve blood flow. After widening the vessel with angioplasty, your vascular surgeon sometimes inserts a stent depending upon the circumstances. 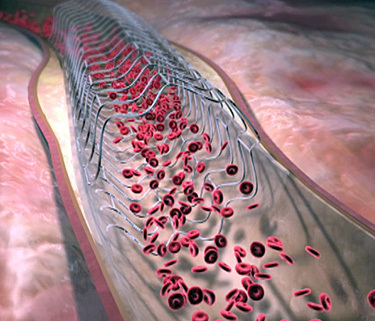 Stents are tiny metal mesh tubes that support your artery walls to keep your vessels wide open. What is the angioplasty procedure? Balloon angioplasty. During this procedure, a specially designed catheter with a small balloon tip is guided to the point of narrowing in the artery. Once in place, the balloon is inflated to compress plaque against the artery wall and stretch the artery open to increase blood flow to the heart.